A quick, classic dinner gets a spicy makeover. 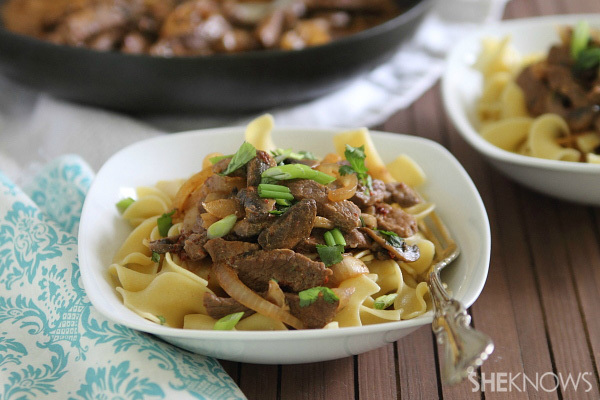 Beef stroganoff is actually a really quick stove-top meal that can be made in just 20 minutes, perfect for weeknight meals. We’re spicing this version up with some chipotle peppers to give the classic dish a bit of a kick. Bring a large pot of water to a boil. Once boiling, add the egg noodles and cook according to the package directions. Drain, toss with the butter and set aside. Meanwhile, in a large skillet, heat 1 tablespoon of the olive oil over medium-high heat. Once hot, add the sliced steak and cook for about 5 minutes until browned on both sides. Transfer to a plate and set aside. Drain the liquid from the skillet, reduce the heat to medium and add the remaining tablespoon of olive oil. Add the mushrooms, onions and garlic and cook for about 5-7 minutes until softened. Add the thyme, salt and pepper and stir. Add the pureed chipotles, beef broth and the meat with its juices. Stir to combine. Add the sour cream and stir to incorporate. Reduce the heat to low and simmer for 2-3 minutes. Plate the noodles and spoon the beef mixture on top. Garnish with the cilantro and/or green onions.